I didn’t quite get how these worked at first, but you know how great it is to be online and be able to click on a link to go read an article or explore a web site? QR codes allow you to put a “link” on a business card, brochure, or whatever. Just a couple of days ago we received a postcard in the mail from our local art museum, and it had a QR code on it, so they are indeed becoming popular. It's nice to know what those funny little squares are...thanks for the post, Katie! LOVE this Katie. I've seen these like at an airport, etc. COOL! Okay, you know what you need a temporary tattoo that people can scan -- I love the t-shirt idea too. But it would be so fun to say "Scan my tattoo" for X! I want to do it! Fascinating! I just saw one on a billboard a few days ago. My designer-in-training stepkid has been talking about these for more than a year but I -- bad stepmom -- haven't paid much attention about how I might be able to use them. This explains a lot! 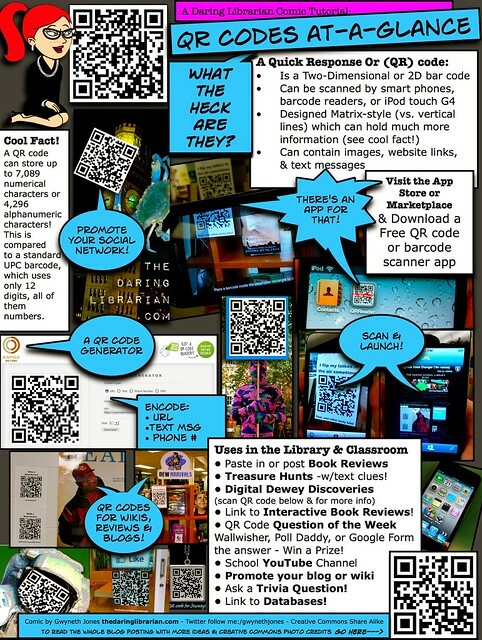 I'd love for people to let me know ways they end up using QR Codes and if find them useful! Thanks for the comments everyone! Hey! Thanks for using my comic! I'm gonna have to snag some of your great suggestions, too!